President: Jim Smith was born and raised in Warsaw, Indiana and graduated from Warsaw High School in 2000. He enlisted in the United States Army Reserves, and served 12 years including 9 months in Kuwait/Iraq in Operation Iraqi Freedom. He currently works for the Kosciusko County Sheriff’s Department, and January, 2018 will mark 8 years with KCSD. Jim has just under 12 years of total law enforcement experience, including 1 ½ year of reserve time and 3 ½ years of full time duty with the Syracuse Police Department. He enjoys volunteering for many service organizations such as Warsaw Breakfast Optimist Club, where he serves on the board of Directors, Leesburg Lions Club, and the North Webster-Tippecanoe Township Chambers of Commerce. Jim enjoys working with the public, and meeting new people, which being involved in these organizations, affords him these opportunities. Jim has been married to his wife Trish for 9 ½ years, and they have two children, Zachary (14) and Isabelle (12) who both are in the Wawasee schools. Vice President: Amanda Meerzo is co-owner of Mohawk Pier and Lift with her husband Jamel. She is a graduate of Grace College earning her Masters in Non Profit Management as well as earning her Bachelors in Business Management. She is excited to share her knowledge and serve her first term on the board. Amanda and her husband Jamel have lived in the North Webster Community for over 10 years. They are parents to Kolton, Kenady, Kingston and Kamden. Treasurer: Kim Bolt has worked for MutualBank for 26 years. Kim began as a Teller but has been promoted to many positions such as Relationship Banker, Service Manager, Manager of the North Webster Financial Center and now Loan Counselor for both the Syracuse and North Webster offices. She helps people with all types of lending from Cars, Boats, RVs, to Mortgages, Home Equities and Home Equity Line of Credits. Kim is married and the mother of 4. She has lived in Tippecanoe Township for 26 years but would come to North Webster to spend time with relatives who lived on Webster Lake during summers. Secretary: Susan Stump has worked for The Papers, Inc. as an advertising representative for 20 years. She is originally from Michigan. Susan is married and has 2 daughters, one step daughter and 3 grandchildren. She has been on the North Webster Chamber Board since 2016. In her free time, she enjoys boating with her husband, hiking, golfing and spending time with family and friends. She is also an active member of the Syracuse-Wawasee Rotary Club, and am currently the Past President of the club. Brenda Peterson has lived all her life in the North Webster, Syracuse and Milford area. She is VP/Office Manager at Lake City Bank in North Webster. She has been with Lake City Bank for 14 years now. She also serves on the Junior Achievement board as treasurer and the Leisure Living boards. Jen Ducey moved to North Webster in the fall of 1988. She was a stay-at-home mom for 14 years during which she volunteered with the North Webster Elementary School PTFO, served as a Cub Scout Leader for several years, was a member and served as the first female President of the Webster Lake Ski Bees and is a member of the Indiana Vintage Snowmobile Club. She then volunteered for a few years with the NW EMS as an EMT-A. She became the Tippecanoe Township Clerk in January of 2004 and continues in this position. Jen joined the Chamber board in July of 2011 representing Tippecanoe Township. Jen loves spending time with her family and introducing new people to the joy of living in a small town. Ron Erb and his wife Mary have had a cottage on Webster Lake since 1980 and moved here full time in 2006. Ron enjoys our small town friendliness and all that lake life offers. 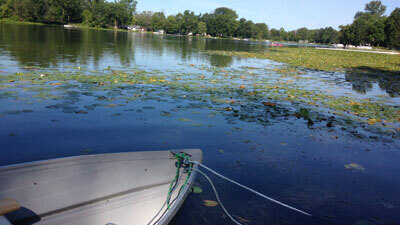 Weather permitting you can find him out on the lake sailing, skiing or just taking in the good life. Ron is a board member of the WLCA, Chairperson of the WLCA Fireworks Committee, a board member of the Dixie Sternwheeler Inc, where he has been a Captain for 9 years, a board member of the Epworth Forest Property Owners Association and a board member of the Chamber of Commerce. In the 80-90’s he held several office positions in the Webster Ski Bees’. Terry Frederick and his wife have lived on Webster Lake for 17 years. They have three children and five grandchildren. The whole family loves the lake and all it has to offer along with the wonderful town of North Webster. Terry is the President of The Watershed Foundation, Vice President of the North Webster Library board, past President of the Webster Lake Association and on the Board of The Chamber. landmark. In 2009 Karilyn retired after 38 years as the music teacher for North Webster School. For over 40 years she has played an active role in the Mermaid Festival and many other community events. She feels fortunate that now she is able to dedicate more time to helping North Webster become a place where people make friends and fond memories. Paula Miller representing Paula Miller Farm. Paula has been involved with farming most of her life. She grew up on her parents dairy farm in Leesburg. Paula also has an associates degree from IPFW in accounting. She not only has worked for farm animal vets for nine years but she also owns farm ground where corn and soy beans are raised. She may not physically work in the fields anymore but she definitely keeps busy. Paula continues to drive school bus for North Webster as she has for the last 25 years. In addition, she attends and serves at the North Webster Church of God, is a member of Indiana Farm Bureau, Inc and the North Webster friends of the library. Paula has one daughter which is employed as a dental hygienist. Martha Stoelting is a staff reporter and a columnist for The Papers Inc. Her beat is North Webster and the surrounding area. Before working in journalism, she was the owner of a retail floral shop, a licensed real estate broker and an employee of the state of Indiana. She was the chamber coordinator for the WNIT-PBS show “Our Town: North Webster” and is in charge of advertising for the Dixie Day Festival and Arts & Crafts Fair for the chamber. She is the former president of the Syracuse-Wawasee Chamber of Commerce and involved in community activities in North Webster, Syracuse and Kosciusko County. She and her husband Paul, a local attorney, have three adult children and a son-in-law. Sue Ward, co-owner of Sue’s Creations, and has been a member of the Chamber for over 20 years. Sue started her business in 1982 with her husband Steve. Over the years she has been involved with the Lady Lions, participated in the original sidewalk days and has given over 5000 roses away in the community through the FTD Good Neighbor Day. Sue sat on the board to help support retail and community growth here in our township. Tammy Waliczek, co-owner of the Dixie Haven Resort has been a member of the Chamber for the last 6 years. Tammy and her husband, David, purchased the business in 2010. Before becoming a business owner, she worked for 18 years as a Human Resource Manager and over 20 years in a variety of sales positions. She also has a Bachelors Degree in Organizational Management from Goshen College. In addition, Tammy serves as Secretary on the North Webster Park Board. Tammy, her husband, David and their son, Lee moved to North Webster in 2012 where they fell in love with the lake and the people of North Webster. She is always looking for ways to be involved in helping the area businesses and people. Mindy Scaggs is a Real Estate Broker with RE/MAX LAKES here in North Webster. Upon graduation from Wawasee High School, Mindy served as a Hospital Corpsman with the U.S. Navy Reserve for 6 years. After living in Kokomo for 20 years, she moved back to the area in 2008. Mindy has worked in sales/management/customer service for 30 years. “I believe strongly in ‘shop local’ and look forward to helping the Chamber in promoting our incredible community and members.” Mindy also serves as our Chamber Ambassador; welcoming new businesses, scheduling ribbon cuttings and organizing our new Business After Hours networking program. When Mindy is not busy selling/promoting our community, you can find her and her husband Rick on the Vintage Addiction (their boat) on the Barbee Chain of Lakes with family and friends, cruising the lakes in their golf cart, or spending time with their 6 grandchildren. Jerry Parsons and his wife Jen of 28 years moved to North Webster in October of 2017. They live in Willis Park on the lakefront. He first came to North Webster in 1986 with his wife, then girlfriend, for her family reunion. Jen’s family first came to Webster Lake in the 1940’s and currently three of her cousin’s own homes on the lake. They raised their children, Zach (27), Audie (23) and Nolan (21) in Fort Wayne and moved here as empty nesters to enjoy the lake and the small town lifestyle. Jerry and Jen met in high school in Muncie. Jerry is a Physician Assistant at Medstat in Syracuse. He is past president of the Indiana Academy of Physician Assistants (IAPA), past chairman of the IAPA Legislative Committee, current chairman of the IAPA Reimbursement Committee and IAPA Chief Delegate to the American Academy of Physician Assistants House of Delegates. Jerry was recently appointed to the Webster Lake Conservation Association Board of Directors. EMILY SHIPLEY is a lifelong resident of the area having grown up around the lakes of Warsaw and northern Kosciusko County. Now a full-time resident on Sechrist Lake, Emily is excited to be a part of the Chamber to keep North Webster a great community to live and do business in. Holding a Bachelor’s Degree in Communication, Emily’s strengths include both marketing and graphic design which she utilizes as an Associate Broker for Todd Realty, North Webster. Emily and her husband, David, have five children who attend both Wawasee and Warsaw school systems.